Are you in the market for a solid refurbished 64-slice CT scanner? When you’re making your list of systems to consider, it’s wise to look at the Canon Aquilion 64 CT and the GE VCT 64 CT. While they have many things in common there are some differences that can affect your choice. Canon’s Quantum detector offers the thinnest slices in the industry at .5mm while GE detectors deliver a .625mm slice thickness. The Aquilion has true isotropic spatial resolution. Canon’s Aquilion offers a continuous scan time of 100 seconds. The GE Lightspeed VCT only delivers 60. The Aquilion CT 64 uses a proprietary tube that costs around $75,000-$180,000 brand new from the OEM. An OEM tube for the VCT can cost even more, but Varian and Dunlee VCT-compatible tubes are available for less than $75,000. If you’re looking at used tubes, the VCT tubes are priced 25-40% less, which makes a big difference. The GE Lightspeed VCT 64 is more compact and has a smaller overall footprint (24 meters square). The Aquilion requires a 27 meters square install area. All VCT 64 scanners can be made XR-29 compliant very affordably. The Aquilion can sometimes cost as much as $75,000 depending on circumstances. The ongoing service costs of the VCT 64 are significantly lower than for the Aquilion 64, thanks to the third-party tube solutions and wider availability of parts and engineers. Aquilion scanners can’t cross country lines, so there aren’t as many available on the market. What Makes The Aquilion a Good Option? 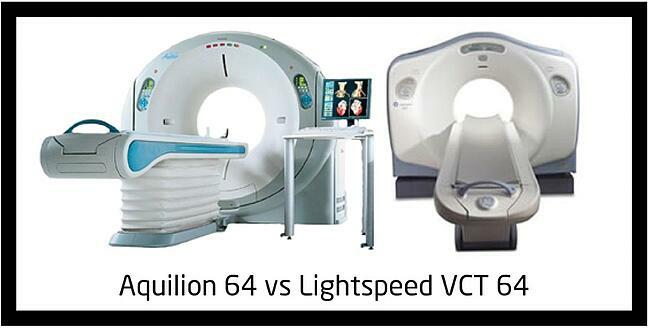 You’ll pay about half the price of a Aquilion 64 compared to GE VCT 64. You read it right; 50% less. Thanks to the thinner slices you get with the Quantum detector, you’ll get better image quality. When buying it on the secondary market, you can simply transfer the software options installed on the Aquilion. With the GE, each successive buyer might have to purchase the software licenses. If you’re going to use a 64-slice Scanner in a general-purpose fashion, the VCT 64 makes more sense. You’ll be able to replace tubes for a lot less. However, if your workload includes fine vascular work, the image quality of the Aquilion 64 is better for you. If you’re in the market for used or refurbished medical imaging equipment for your clinic, hospital, practice or healthcare facility, it makes sense to talk to an expert at Atlantis Worldwide. We can help you determine which make and model makes the most sense for your needs. Contact Us Today! Do you use Mobile Devices for Medical Imaging?